Chalet at Sawyer Creek is a secluded vacation getaway tucked halfway up a mountain and hidden in the trees. Access is easy with a good road and plenty of room to park. The chalet has a large, elevated, wrap-around deck with hammock, picnic table, lounge area and grill; it's like being in a treehouse...private , too! The great room has lots of wood and glass giving it an airy and "open" appearance. 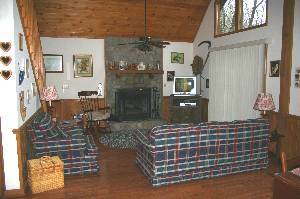 The stone fireplace, hardwood floors and cozy furniture add to the ambiance of a mountainside hideaway. 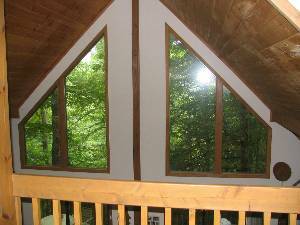 The master bedroom and bath are in the loft above the great room with a large window looking out into the forest. Here, you will find a king size bed, walk-in closet and reading nook. 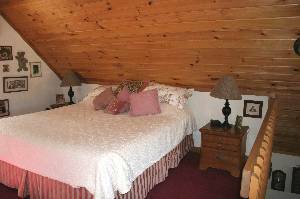 Downstairs is another bedroom with twin beds. They can be pushed together easily for couples. Another bathroom is right across the hall. The kitchen is fully equipped and opens out into the great room. That's a nice feature for the cook; He/she can be part of the action while making dinner. There's even a waffle iron. An added bonus...You can drink our delicious mountain water right out of the tap! It's blue shale...the purest and sweetest you can get! Relax in the hammock, pick berries outside your door, or hike to the Appalachian Trail. You can trout fish in nearby streams, enjoy nature, walk to a waterfall. or just get away from it all. If you want to fish without driving, down at the base of the mountain, Sawyer Creek gets wider, and you can fish off the bridge near the cabin. You might just catch trout for dinner! Chalet at Sawyer Creek is what one comes to the mountains for! With over 80% of the area a national forest, you're really in the mountains, yet a short distance away are wonderful places to go, shops, restaurants, and even some terrific mountain music. 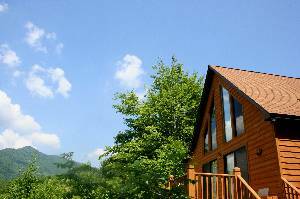 You can more of us on Facebook when you type in "Mountain Cabins." 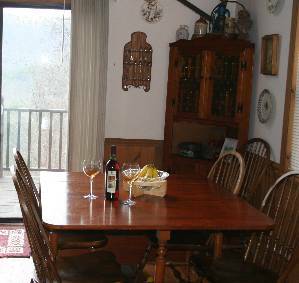 Enjoy a view of the smokies while relaxing on the secluded deck. Snuggle up to the stone fireplace in chilly weather. Enjoy forest views from anywhere in the chalet. What a great place to be for a romantic dinner! Fall asleep to the sounds of the mountains on a new king size bed. New twin beds and full bathroom are downstairs. What a beautiful place to stay for a vacation! The view is gorgeous, whether you're inside or out... The cabin was very comfortable and had everything one could want or need for a week's getaway. It was neat, clean, and nicely furnished, with lots of personal touches everywhere. The owners are very friendly and were helpful from the day I first inquired about the cabin. Melanie has personalized everything with her wonderful sense of humor! I really enjoyed being close to so many hiking trails (there is an access point to the Appalachian trail less than 10 minutes' drive away). This truly was a pleasure! First of all, we have stayed in a few different cabins over the years. Some very nice cabins but without the view and some great views but not the nicest of cabins. Well, this one had both. WOW! That's all we could say to each other when we first arrived. The location was perfect also. We had a wonderful time, hiking and exploring the area. Joyce Kilmer Park is an easy hike, our 74 year old mama had no problem. Beautiful. Melanie has a wonderful, and comical review list of area attractions and eateries. We found this to be very helpful. Melanie and Bill, y'all can go ahead and pencil us in for the same time next year. (If not before) Loved it!! Where do I even start? We have just returned to what feels like the flatest part on earth - from this lovely cabin with a view you just cannot beat. From our very first contact with the owners (Melanie and Bill) to the moment we locked the door behind us -- it was truly a pleasurable experience. Melanie and Bill answered every question I had; and the suggestions they sent and detailed book they had handy, left no question unanswered. The cabin is perfect - absolutely beautiful setting overlooking this stretch of mountains (what you see, is what you get! ); peaceful, serene - awaking to the mist clearing in the morning, coffee in hand on the lovely porch. Inside, everything we could think of, we had. Loved the gas stove! Made many nice meals, enjoying the charcoal bbq while watching the sun set. The area for us, was perfect - extremely close to Tsali and Nantahala for biking; Bryson City and the Road to Nowhere was a good ride as well. Great base site for any avid cyclists! Tried some restaurants recommended - also proved right on the recommendation! The cabin is very comfortable; shower pressure's fabulous; bed very comfy; and kitchen was great to cook in - with an amazing view, to boot! Every morning, we'd set our day's plans and go from there. Secluded, yet close to what you need. I would recommend this (and already have) to anyone looking for a great cycling adventure; or just time away in a beautiful place, where you can relax and get away from it all. We'd come again, for sure! We want to go back! This cabin was perfect for our family of four. Even though it rained almost the whole time we were there, we were comfortable and happy. The kitchen is well-equipped, the beds and furniture are comfortable, and the view is wonderful! 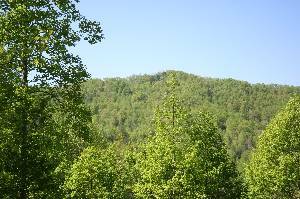 We especially enjoyed being in a part of the mountains that is not too crowded but still offers plenty to do! The view was fabulous, and it was constantly changing. We loved sitting on the deck with a glass of coffee in the morning or wine at night and just admiring the view. The cabin was spotlessly clean and had very cute mountain decor. This was the first time we tried a vacation rental; it will not be the last. Everything was wonderful. The realtors say "Location, location, location." Everything was close by. We were in the heart of the Smokies and never had to drive far to find a new activity. If we ever build in the mountains, this will be the place. It's spectacular! The cabin was incredible and very clean...nice to have a king size bed and wonderful mattress. We had a ball and will be back next year. We loved it...not tons of tourists but lots to do. We loved the railroad and whitewater rafting trip. Thanks for everything...even the waffle recipe. It's going to be a yearly event now. 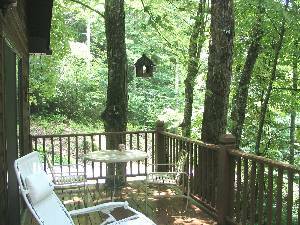 The deck is great for relaxing and the privacy is wonderful. We had a great. There was so much to do and the cabin was perfect. Even our teenager had a terrific time. We'll be back. Thanks for all the "homey" features. We'd breathe a sign of relief to be back in the cabin after a full day of exploration. The Cherohala Skyline was amazing. Your book of things to do was so helpful. Thanks again. You run a first class operation. 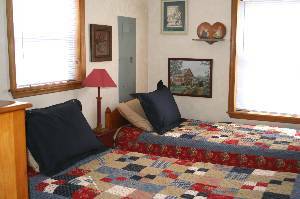 $110.00 per night (3 night min.) $650.00 per week plus taxes. Deposit: $100 security deposit returned to you when key is mailed back and cabin left in good condition. Cancellations and Refunds: Full refund if I can rebook your dates. Required Stay: 3 day minimum.